Finally: an easy low Carb yellow cake! It’s gluten free, refined sugar free, paleo and only requires one bowl! Happy second birthday, A Clean Bake! What I will say is this: this year was full of blogging ups and downs. I’m slowly learning what you guys really want (and your answers to this survey are invaluable, and you can always email me, too), and how to balance it with what I like to cook and eat – the last thing I want to do is try to pass something off on you that I am not excited about. Sometimes I think I have it nailed and then you guys are all meh, but other times I post a recipe as an afterthought and you guys devour it. So, it’s a work in progress. I think about this website from the minute I wake up in the morning until the minute I go to bed. It’s probably not healthy, but if ever there was anything worth obsessing about, it’s great food, right? I love to cook and I love to eat, and this site is for anyone who does too. I mean anyone – not just those with dietary restrictions. As my health improves day by day, I have started to really resent not being able to eat freely, without weighing the risks of each ingredient. Not being able to share food, having to eat odds and ends while everyone else has a full meal, or even bringing your own meal can feel isolating. The most amazing feeling in the world is when I can sit at a table and eat the exact same thing as everyone else – and many of you have commented or emailed me to express a similar sentiment. 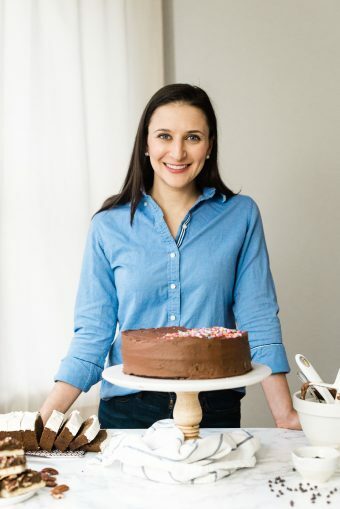 So, in the coming year, my plan is to continue to share accessible, gluten free, sugar free and (mostly) low carb/grain free recipes with you that don’t require any crazy ingredients or excessive time, and – most importantly – are naturally allergy-friendly in a way that won’t make the rest of the diners at the table feel deprived. 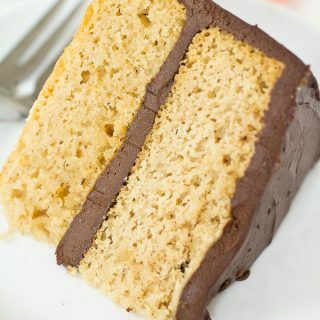 This yellow cake, for example, is made exclusively from wholesome ingredients that you can find at any grocery store, comes together in one bowl, and produces a moist and light vanilla-rich crumb that everyone will enjoy, regardless of whether they are used to eating grain-free cakes or not. I’ll try to make your life easier, by keeping recipes straight forward and making sure the tips – like meal planning, getting the most out of your freezer, etc – keep coming, so you can continue to make delicious dinners that are naturally allergy friendly AND don’t require a ton of planning and prep time. All this will, of course, be in addition to the sweet treats you expect to see here. Sound good? So that’s me. Now it’s your turn. It may be ACB’s birthday, but you’re getting the cake AND the presents. 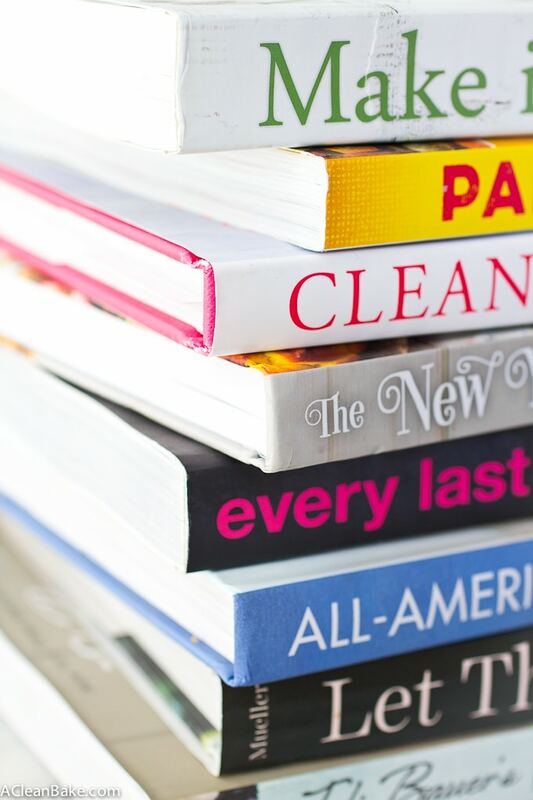 I am giving away the most outrageous prize pack, full of some of some of the most indispensable ingredients and cookbooks in my kitchen. One lucky winner will have to empty out a cabinet for all the new swag coming their way. Shouldn’t it be you? Quick bureaucratic tangent: Contest begins immediately and lasts until 11:59pm on March 18, 2016. Winners will be chosen at random. Contest is open to US residents only (sorry!!). A few more words about this yellow cake: It only requires one bowl, is moist, dense and strong enough to layer, and somehow, rises nearly evenly every time, requiring little to no trimming for flat, stackable layers. And did I mention it only requires one bowl? It’s easy, healthy, real food ingredients, sweet and satisfying – a perfect recipe to symbolize the last two years of A Clean Bake, and hopefully many more to come. Finally: an easy low Carb yellow cake! It's gluten free, refined sugar free, paleo and only requires one bowl! Preheat the oven to 350F. Liberally grease or spray two 6" round cake pans and set them aside. In a large mixing bowl, use a hand mixer fitted with the beater attachments to beat the eggs until frothy. Beat in the oil, then add the vanilla, vinegar and milk and mix until combined. Add the salt, baking soda and tapioca flour and mix until combined. Mix in the granulated sweetener, then add the almond flour and beat until the batter is smooth and no lumps remain. Divide the batter between the two prepared baking pans. Bake for 20-25 minutes, until the tops of the cakes are lightly golden and firm to the touch. Remove from the oven and allow to cool in the pans for 10-15 minutes or until the cake begins to pull away from the sides of the pan. Turn onto a wire rack to cool completely. Finish using this homemade dairy free chocolate frosting or your frosting of choice. You'll need about 2 cups of frosting, give or take. You can also garnish with dark chocolate chips, if desired. Layers may be made in advance and kept frozen, wrapped very tightly in plastic, until ready to use. Bring to room temperature and frost immediately before serving. To make a single layer cake, use the recipe in a (well greased) 9" round cake pan. You will have to increase the baking time slightly. For a double-layer 9" cake, double the recipe and split the batter between two (well greased) 9" round cake pans. Thank you so much to the following generous partners who are helping me with this blow-out giveaway: Natvia, Now Foods, Bill Staley and Hayley Mason, Julia Mueller, Becky Winkler, Caroline Potter, Juli Bauer; Jennifer Robins, Simone Miller, Victory Belt Publishing, Skyhorse Publishing, Harvard Common Press, and Page Street Publishing. Nora, this cake looks amazing! Congratulations on two years of A Clean Bake, and here’s to many more. 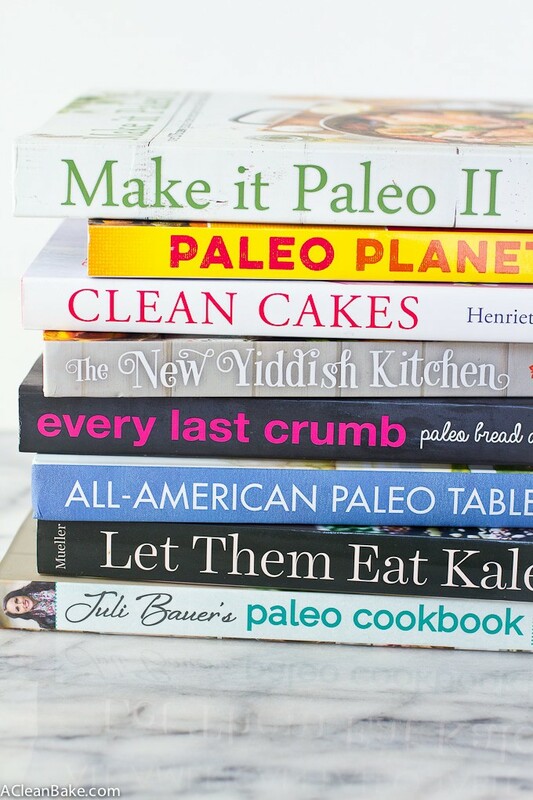 Thank you so much for including Paleo Planet in your celebration. 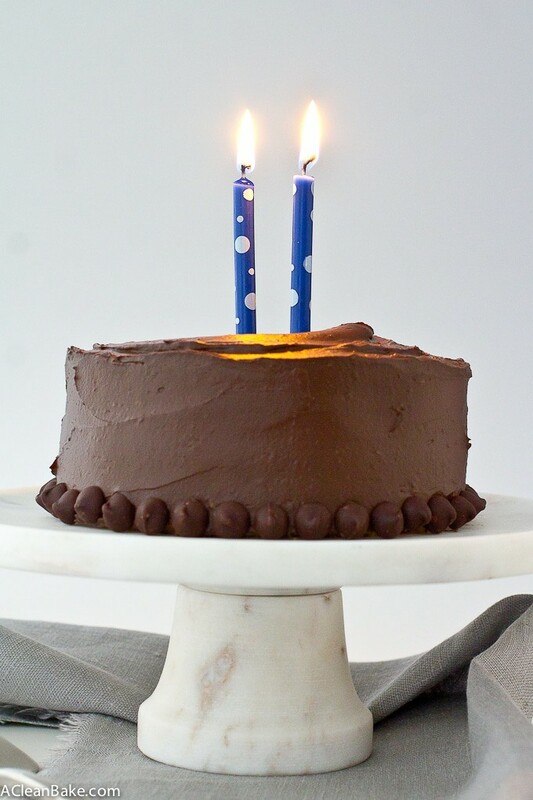 What better way to celebrate your 2 year blog anniversary than with this beautiful classic cake! Congrats on your hard work and dedication to this lovely site! Totally, it’s a classic! Thank you so much! Ooh definitely let me know what you think of the cake! I wish I could send a big slice your way to say THANK YOU for all of your support. You are the best! Thank you!! Yes, absolutely! What is a birthday without cake!? Congrats on two years!! That is seriously awesome! And another thing that is seriously awesome? 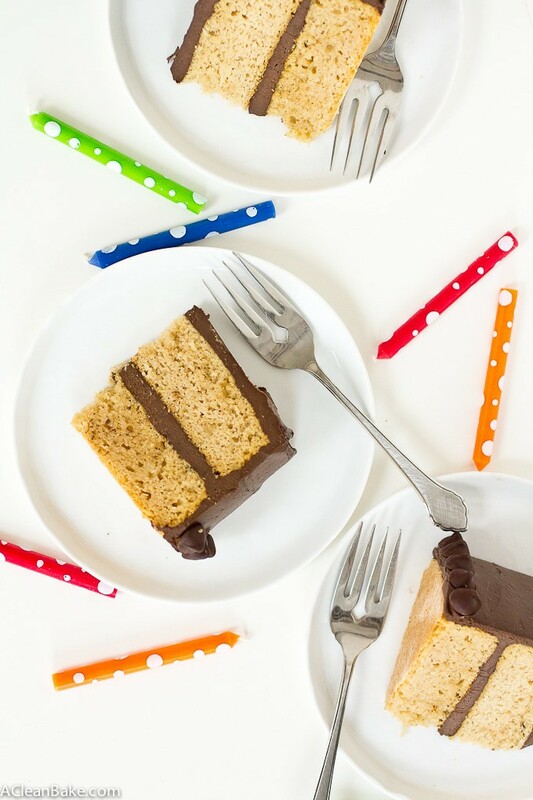 Okay, there’s two – one, this cake is out of control gorgeous and two, the giveaway is bananas! 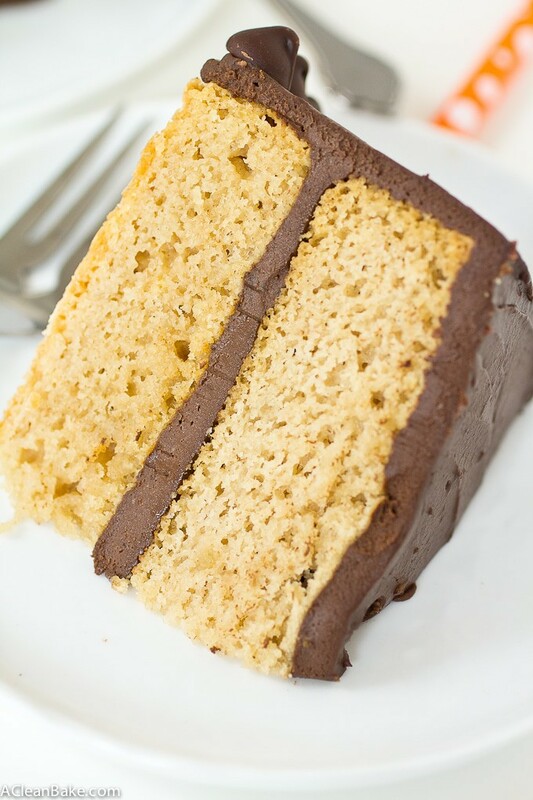 Seriously, this cake is making my mouth water – I think I’ll have to try it! Such an awesome recipe and giveaway, to celebrate a fabulous blog anniversary! thanks for everything you share and for how much care you put into this site! i’d like to enter the giveaway but–gasp!–i’m not on instagram. That’s no problem at all. I’m sending you an email now! Congrats on two awesome years!!! I would be beyond thrilled to win this! Thank you so much for offering such a wonderful giveaway. Hi Kristie! I totally hear you on the modifications. I’m a serial recipe-tweaker too! Thanks for catching that blip in the recipe instructions. It should be baking soda, per the ingredient list – whoops. With a few exceptions, I use baking soda as much as possible, because baking powder tends to contain cornstarch, which some people can’t tolerate. However, baking powder probably didn’t make much of a difference in the recipe because the amount called for was so little, so if cornstarch doesn’t bother you, it shouldn’t be a big deal. I’m glad it worked for you! Did you have too increase the baking time at all? I wonder if the extra liquid in the honey made a difference. Also chocolate chips = genius!! I actually make my own baking powder with the soda and cream of tartar. I read about that on another paleo blog and I just do that now. 🙂 I did have to increase the baking time by about 15 minutes – and, yes, I figured that was because of the honey. I make pecan butter (it’s my side income) and I’m going to try a frosting recipe next that uses pecan butter and melted chocolate. I”ll let you know how that goes. I could be on to something. Or not. It’s always a mystery when you start to tinker, right? Thanks, again for the recipe and the reply. Interesting! I’ve never made my own baking powder. Sounds like a great idea. As does the (MOUTHWATERING) pecan butter frosting. Wow! Please let me know how it goes. I love baking experiments like these, and I can’t imagine how pecan butter and chocolate could go badly! This is a great cake. I have friends and family with allergies and its great to know there is a cake I can make that we can all celebrate with. Thanks for a brilliant recipe.Sammie. I can’t resist these pictures! Must bake! 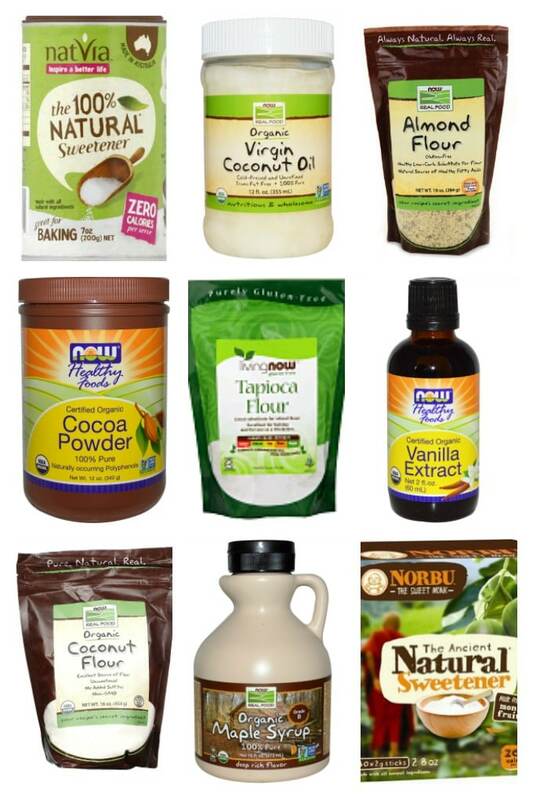 How do you think coconut sugar would hold up as a the sweetener? I haven’t tried it, but my sense is that coconut sugar should work fine! 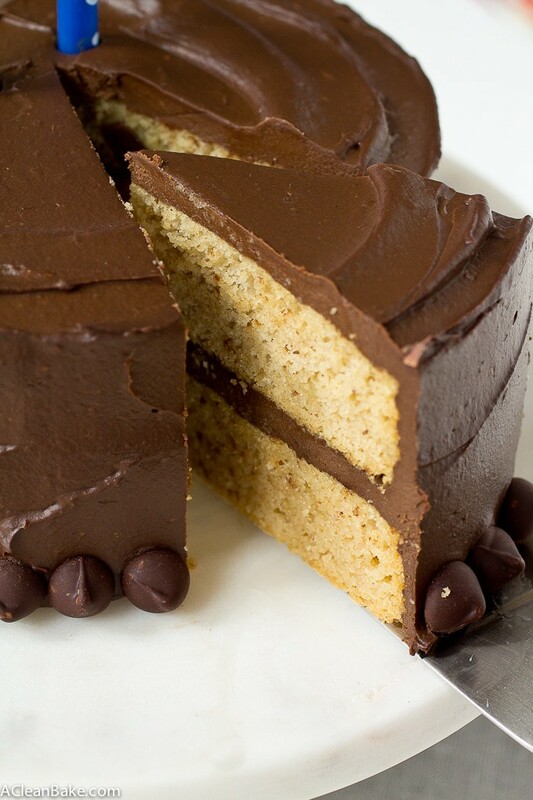 Just know that it will turn your cake light brown, rather than yellow, and give it a slightly caramel-y taste (not bad! Just maybe not exactly what you’d expect from a vanilla cake). Also, it tends to be less sweet by volume than granulated stevia or monk fruit sweetener, so be prepared to taste the batter before you put it in the pan and add some extra coconut sugar if you want (it’s totally up to you). You may need 1.5-2x what the recipe calls for in stevia. Let me know how it goes! is the tapioca flour absolutely necessary? i know u use it in a lot of your recipes but could i just use all almond or oat flour? Yes, unfortunately it is. The recipe has been formulated to take it into account so I’m not sure what will happen if you use almond or oat flour. If you’d like to replace it, the only replacement that will work properly is arrowroot starch. Sorry! Hi Debbie! It is hard to say what is going on just based on the cooking time. Did you make any changes to the recipe (ingredient swaps, making it in a different pan, etc), and also, do you have an oven thermometer in your oven to make sure it is preheating to the right temp? would avocado or coconut oil work? i don’t have any grapeseed or canola currently but hoping to make this today!! Thanks! Avocado oil would definitely work! I don’t recommend coconut oil. 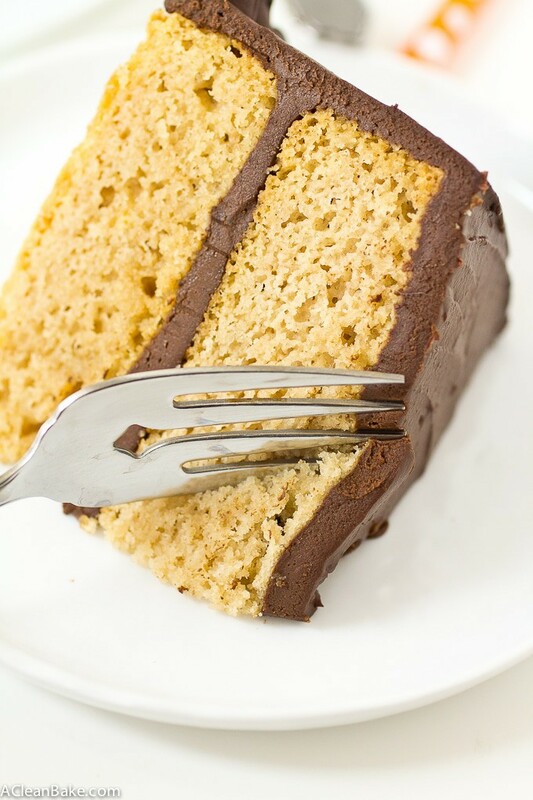 I found a wonderful Keto chocolate cake and was looking for a similar yellow cake recipe. I found yours and just made this cake for a birthday. It was tasty and my guests (including the kids) loved it. However I’m not sure where mine ended up not quite right. I followed the instructions for 2 9″ pans in your footnotes and the cakes turned out very thin and kind of dense. In fact when I poured the batter into the pans it covered only about 1/4″ deep. Would the oil used make a difference? I used coconut b/c it’s what I had on hand and I don’t mind the coconut flavor. Any advice would be helpful. Hi Lisa, did you double the recipe for the two pans? Also, coconut oil will affect the texture, but it won’t change the amount of batter or the rise. It’s a fairly dense cake compared to wheat-based cakes, but it shouldn’t be a dense slab as you describe. Another common culprit may be expired baking soda. Let me know if I can be of further help! I’m looking for a yellow cake recipe to replace the recommended boxed yellow cake mix for a bundt cake recipe. Do you think this recipe will hold up for that use? It will also have pudding injected into it at the end for which I am also looking for a suitable recipe). I would not use this, because I don’t know how it will hold up when the pudding is injected. Sorry! Hello, so excited to try this as my husband asked for good old yellow cake for Father’s Day, but I can’t bring myself to get a box and cook that with all the crud that comes in it. Only problem is my son has severe nut allergy so we don’t use any almond flour. Everything else in the recipe we could do, and we mostly use cassava and coconut as our Flours. Could I sub the flour with a different kind? Also, Could I use olive oil as the oil? Hi Courtney! Unfortunately, I have no tested this with nut-free flours, so I can’t offer a sub. But you can definitely use olive oil, although I’d recommend using virgin (not extra virgin) olive oil to minimize the olive flavor. I didn’t change a thing and mine has been in the oven for 41 minutes and the center is still not firm… feeling ticked I wasted $$$ (and time) on these speciality ingredients! Do you have an oven thermometer? It sounds like your oven may run a little cool.